The first units of Battery 485 arrived in The Hague on September 3rd 1944 to take part in the V2 offensive. The second firing platoon of this battery (Battery 2./485) launched the first V2s on London from Wassenaar on September 8th. On September 10th 1944 the first firing platoon of battery 485 (Battery 1./485) was also stationed in Wassenaar. Battery 485 and battery 444 formed 'Gruppe Nord'. Battery 444 was situated on the island of Walcheren. In reaction to operation 'Market Garden' battery 485 withdrew into Burgsteinfurt in Germany on September 18th 1944. One day later battery 444 also withdrew from Walcheren. On September 21st the firing platoons 1 and 2 of battery 485 returned to The Hague region, on which occasion a new launching site was prepared in Hook of Holland. On October 3rd the second firing platoon of battery 485 resumed launching from Ockenburg, in the south-west of The Hague. The previous day the first firing platoon had departed again to Burgsteinfurt, from where V2s were fired on Liege. The third firing platoon was also situated here. The second firing platoon used the site Bloemendaal adjacent to Ockenburg on October 7th for the launches. On October 21st the third platoon of battery 485 (Battery 3./485) had arrived to reinforce the troops. The third platoon of battery 444 did not become operational until November 15th 1944. On January 28th 1945 battery 444 returned to the launching sites at Burgsteinfurt. On February 1st 1945 Battery 485 was renamed Artillery Regiment 902. At the end of January 1945 launching sites in the Statenkwartier were put into use: among others, the one near the Municipal Museum (Gemeentemuseum). In the beginning of March the launching site near The Hague's City Forest (Haagse Bos) was put into use. Because the ground of the launching pads was firm in the Statenkwartier and The Hague's City Forest (Haagse Bos) most launches from there were successful. On March 28th 1945 the first and second firing platoons of Artillery Regiment 902 were withdrawn to Fallingbostel, about 35 kilometres north of Hannover, where they arrived on April 1st. After that the V2 operations stopped due to the total chaos in Germany. 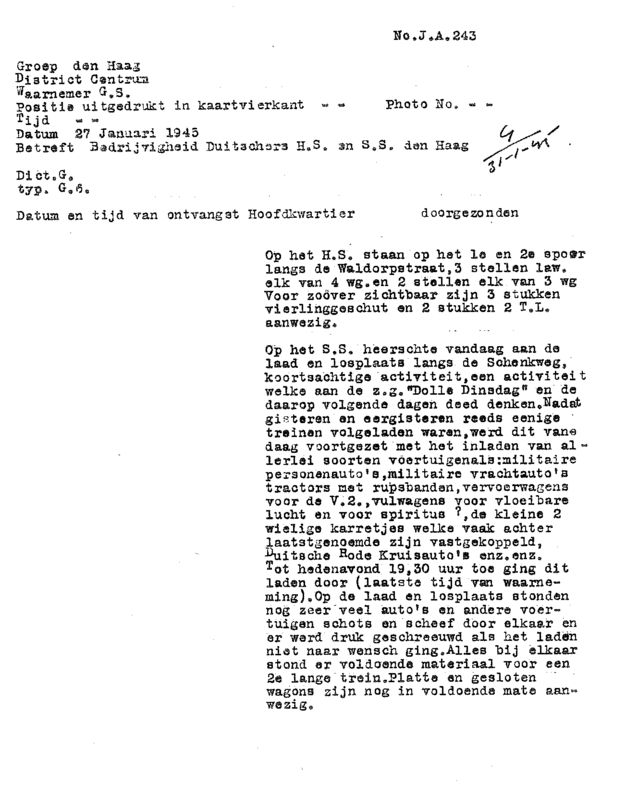 Resistance message concerning the departure of the battery 444 to Burgsteinfurt25.